LONDON.- Curators of the National Portrait Gallery's new exhibition The Indian Portrait 1560-1860 - which opens tomorrow - will reveal a six-foot, seventeenth-century life-size portrait of the Emperor Jahangir which they claim is the largest painting to come from the Mughal empire. 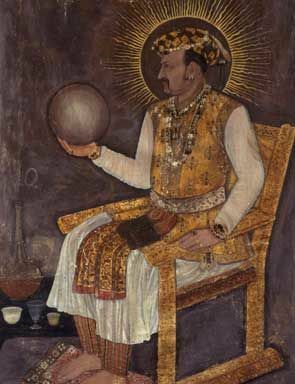 Jahangir holding a globe, dating from 1617, is opulently painted in gold and watercolour on cotton and includes relief jewellery. Apart from its appearance in an auction-house catalogue in 1995, the epic portrait now on view at the Gallery's exhibition has never previously been seen. It shows the Emperor seated on a European-style chair, his head surrounded by a radiating nimbus of light, balancing a globe in his right hand. These allude to his honorific name, Nur al-Din ('Light of the Faith') and to the name that he took on his accession to the throne, Jahangir, meaning 'world-seizer'. He is dressed in court garments, including a patterned sleeveless jacket and two patkas (sashes) around his waist. A lengthy Persian inscription written in a fine hand around the edge of the painting records that the portrait was painted in the twelfth year of Jahangir's reign. It praises the Emperor and extols his victories, including his conquest of the Deccan in that year. 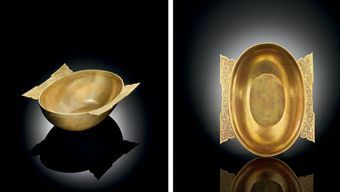 While the medium of watercolour and gold on cotton would have been familiar to Mughal artists, the exhibition's curators Kapil Jariwala and Rosemary Crill say the portrait's large scale and colouring derive from European oil painting. Large-scale European paintings were known at the Mughal court as early as 1602 while Jahangir is reported to have displayed English portraits behind his throne at the New Year festival in 1616-17. The artist is not named, although his skill is praised in the verse. At the bottom right of the inscription is a small cartouche with the words 'amal-i-kamtarin ('work of the lowliest'), but the matching cartouche in the bottom left hand corner has been damaged so that the name of the artist is no longer visible. Abu'l Hasan, the highest ranking painter of the time, has been suggested as the artist. The portrait is one of the star exhibits in the National Portrait Gallery's new exhibition, the first to be dedicated to Indian portraits which brings together 60 works spanning three centuries from international public and private collections. Important loans include: two portraits from the private collection of artist Sir Howard Hodgkin; two pages from the Padshahnama made for Shah Jahan, now in the Royal Collection, and a pair of images of the Mughal courtier 'Inayat Khan close to death, which have never previously been shown together in the UK. There are also striking portraits such as those of Amar Singh II of Mewar taking his ease, and the Maratha general Ram Rao Phalke, which call for a re-examination of portraiture in India. The Indian Portrait 1560-1860 is curated by Rosemary Crill and Kapil Jariwala. Rosemary Crill is a Senior Curator at the Victoria & Albert Museum. Her publications include Chintz: Indian Textiles for the West and Marwar Painting. Kapil Jariwala is an independent curator whose recent publications include Cultural Ties and Film Fantastic: Indian Movie Poster Art. Lorenzo lotto (venice circa 1480 - 1556 loreto), portrait of a jeweler, probably giovanni pietro crivelli. Attribué à corneille de la haye dit corneille de lyon (1500/1510 - 1575) portrait d'homme. Attribué au chevalier rivalz. portrait d'un humaniste.